Yesterday I had a sensible plan to update Vanity Moments, since it turned four yesterday, silently even without its own knowledge. You might be remembering a post which I dedicated to the third birthday of my blog exactly one year back. 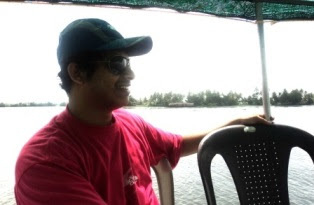 It had some reminiscences of my Alleppey backwaters trip which I made with a friend a few days prior to 24th July 2010. Since, the chance to bask in the glorious shades of luxuriously floating and oscillating houseboat, completely free of cost was brought to me by a short video which I made on Kerala’s tourism perspective, which eventually became the first post of my blog; I had dedicated the memories of that unforgettable houseboat trip to vanity Moments. And what is surprising now is that, when my blog became one more year older, I had been celebrating with my colleagues, an almost similar boat cruise through the heart of the same much-celebrated backwaters of Alleppey. When my colleagues informed me about such a trip that they were planning to make on a Sunday, and they expressed their sincere pleasure to make me also a part of that journey, I delightfully towed down to their demand. So, we set forth our journey in the morning and reached the renowned backwaters of the Venice of the East by 10.30 in the morning. Without much later we began our day long cruise through the ripples and wavelets singing sometimes, and sometimes buying eatables from the coastline toddy shops. Since it was the tourism season, you would have been able to see a pack of houseboats anchored at somewhere, or sometimes you might see one of them darting towards you steering through the backwaters. Local country boats, which are used for transportation often were passing across the lake from one shore to the opposite and vice versa carrying the passengers. Seeing them at a distance, our driver blew the horn in order to warn them. Here, I am posting a picture of myself to give you the smallest hint of the pleasure of our trip. In this picture, I am sitting on the roof of the motor boat watching the ripples. Hope the trip would be enjoyable to you too if you were in my place. Thanks Tomz! As much as we love to see your face, we would have loved to see the boat too. Please share more pictures... And congrats on the blog's birthday! Wow, so your baby -- your blog is 4 years old today. Congrats and sure the trip must be fun. Heartiest congratulations to you for completion of 4 years of your blog. Keep posting. I enjoy reading each and every post of yours. I love Kerala because of its scenic beauty and greenery all around and also boating in backwater. Tomz congratulations on your blog anniversary. Gosh you are senior when compared to me in this blog world. It is interesting you know that this current post is an anniversary post coz I just posted my 50th one so it is also a sort of an important event. 4 years :O God that's awesome, congrats! Guess I have to make mine call "vanity moments" as his Daddy! Hey, Tomz...U have gained weight..as far as I can see from that picture...If u won't BPL, then I would say...I was thinking that was the Boat Driver...hehe!!! Me too have been for a boat ride with the whole family 2-3 years back...to be frank, I enjoyed jumping into the waters rather than sitting on the boat..haha!!! so you had lot of fun it seems....and congrats on completing 4years of your blog...keep blogging. Congratulation for such a long time of posting! And your water trip sounds really good - a houseboat is something exciting - to have a home and at the same time be in different parts of the world is alluring. A day on the water with friends is indeed something to celebrate and so is a blog anniversary. Congratulations! It's good to see you looking so well and happy. Thank you very much..more pictures are shared on my fb..
yes..trip was delightful..and thanks fr ur wishes..
thank you very much..U r junior to me in case of blogging, but content-wise and in terms of readers, u r far far more advanced than me..
Yeah, u surely must do the boating if u ever visit kerala.. Hahaha..I like ur frankness..where did u have ur boating? but be careful while jumping into the river.. Thank you..yes had fun..sure u also shud enjoy boating..i heard in Nainital u have boating..but in Alleppey u will get a different experience..
yes, it was indeed fun..and thanks fr the good comments..
hahaha...yes bap, but hero,..mmmm..i doubt..
happy blog anniv....4 years...i haven't even managed my first century yet. i have from fly and friends the backwaters are beautiful.